My build log... back dated to what I consider my actual date of commencement up to today events. Found information on HMS Bellerophon on the internet which rekindled a spark. My interest in the Billy Ruffian stems from my joining #141 Royal Canadian Sea Cadet Corps Bellerophon of Welland Ontario Canada in 1967 at 12 and a wee bit years of age. I have not been involved in the cadet movement for over a quarter century now but those great memories haven't died away. Overwhelmed with the work done by others and information available; realize how little I know; determined to do my homework. My last (and only) scratch build was a 27 ft whaler. I was quite familiar with them (and the 30 ft. cutters) as I worked at the boat shed at HMCS Quadra for two summers. 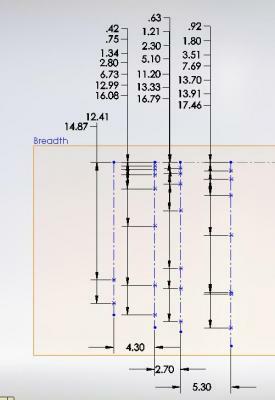 Found literature on rigging details on another site; looking for info on mast size details. 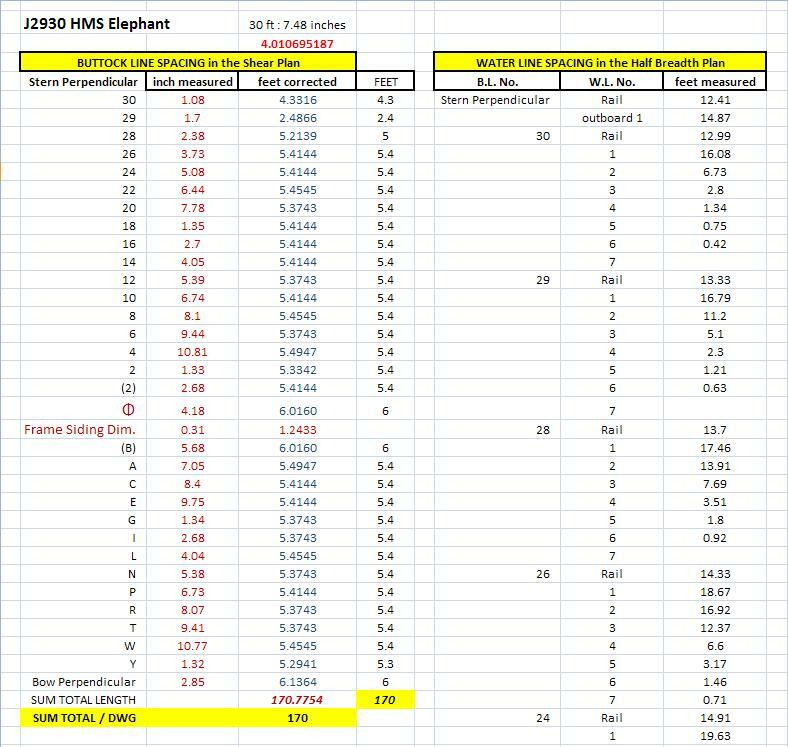 HMS Elephant (built same time as Bellerophon so may be the best plan). £60 each = $107 CDN ... pretty steep. E-mailed NMM to see if there was a “buy in bulk” price discount. 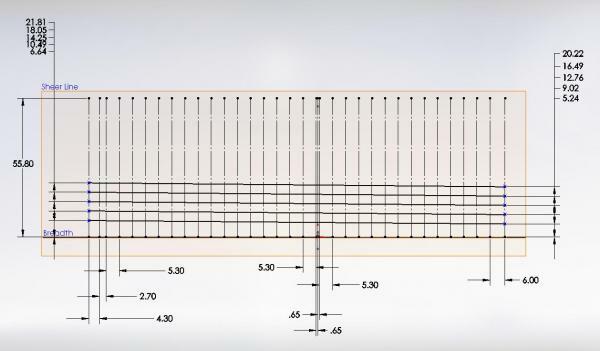 These plans are about 3 ft x 7 feet each. Not sure where I can lay them out to use and NMM insists they cannot be copied (to make a working set and keep these clean). This presents a problem. I decided not to look at HMS Vanguard as it was the last of the ships built... well after the Bellerophon... and so might possibly have other changes. Realize if I download build photos and reference documents into folders from the FORUM and other sites and build my own reference library I will retain more of what I see in my memory (works for me as I am “hands on” type of learner). This has kept me busy! Found on inter-library loan (Gateneau, Quebec, Government Library, 3 week duration, 3 renewals, no charge); this will allow me to decide (for free) if I should buy the book. Discovered there are two different figureheads for the Bellerophon; Downloaded photographs to my reference library. The first has only the neck and head remaining but is said to have been a full body. The second was torso and head. I intend to recreate the first using the second for inspiration! Received a collection of modelling reference books purchased from a member of this site. 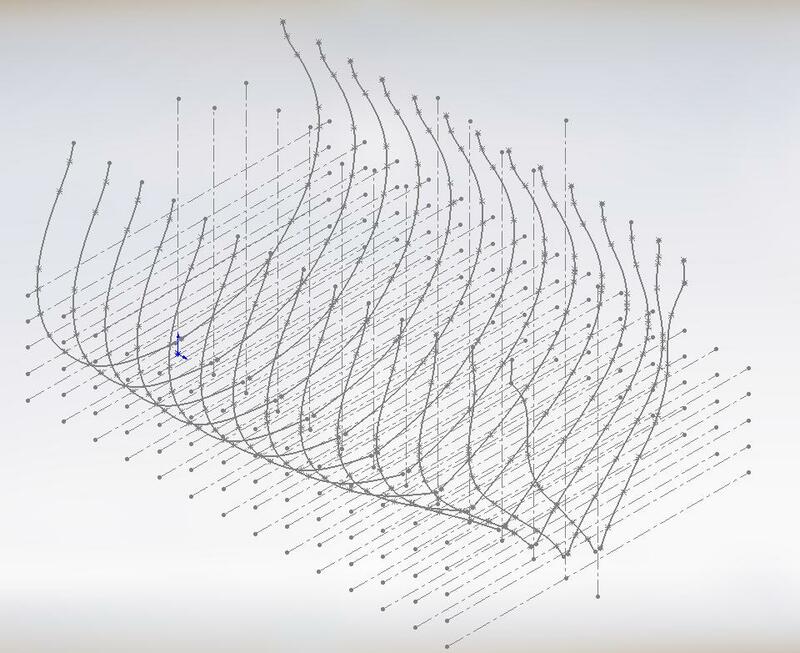 Most turn out to be exactly what this sorrowful example of a modeler needs. Talk about an idiot`s luck! After some confusion (mostly on my part) I finally ordered and downloaded the TIFF ships plans from NMM. 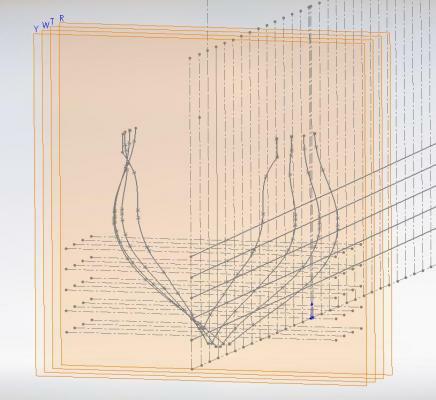 Decided on the TIFF image as it is the clearest possible and I do not have the room to layout 7 foot long plans. It cost me £150 for the set of three (3) images. They gave me the three JPEG images (quoted at £50 a set) for free. There is a considerable difference in detail between the two types of files. I am not disappointed. My PDF program (from which I can measure) will not open the TIFF images because they are too large for it and the JPEG images are too grainy. Converted the TIFFs to PDFs at 1200 x 1200 (Largest the program would allow) and they are very clear! 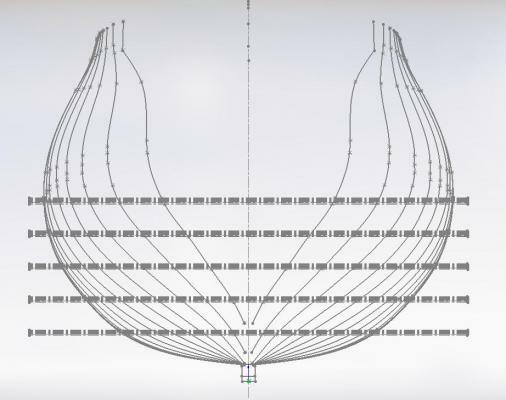 Now I intend to get my measurements off the electronic images and redraw in Solidworks to be able to create templates. I will start my posting of images from here. Might be a while as I have to figure out quite a bit and the first step is always the hardest. Once I have the plans partially redrawn I can make a final decision regarding the scale of the scratch build and degree of finish or completeness as I will also have to decide where the final display resting place might be. I have stepped through to the dark side … no going back now, eh? 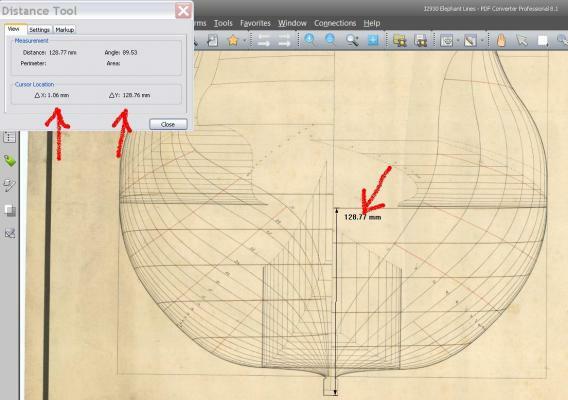 Following photos are clips taken from my PDF program showing how I intend to get my measurements. I will use the scale provided on the drawings to convert my small measurements to full size. It is difficult to get a perfectly vertical or horizontal measurement so I will need to use some old fashion trig calcs to make corrections like the straw man said in the wizard of oz; record all data in excel and then transfer the info to Solidworks. 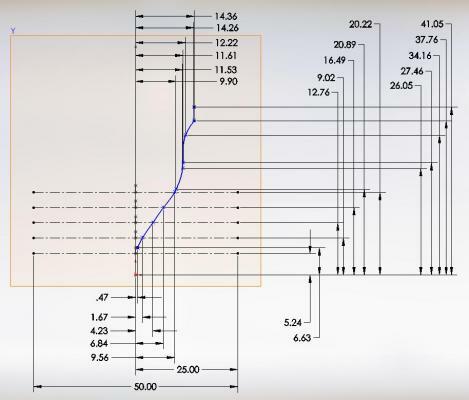 I am familiar with engineering drawing prints stretching and have had heated discussions with the young'uns measuring directly off a print on the shop floor. No idea how 200+years distorts stuff so your warning is timely. I have been working on the measurements this afternoon. 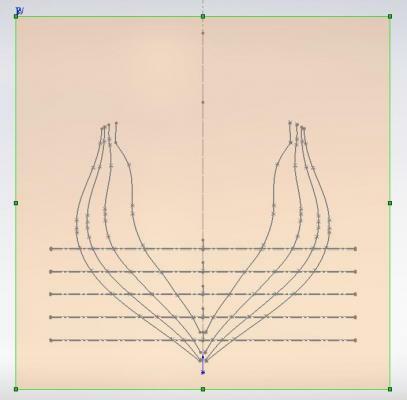 Completed the Buttocks Lines in the Shear Plan (almost looks like I know what I am talking about, eh?) and made adjustments so the overall dimension matches. Just now realized the program allows me to put a scale factor in so it corrects the measurement to full size automatically.... DUH! Working on the Waterlines in the Half Breadth Plan now. 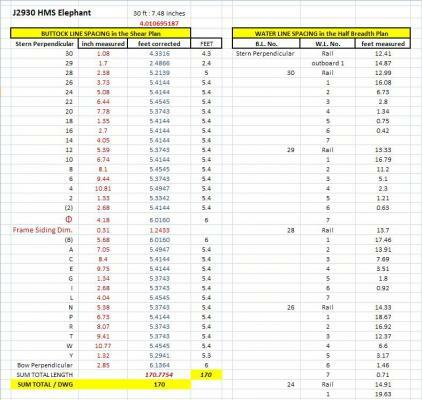 Completed collecting data from HMS Elephant shear and half breadth plans. Need the waterline heights yet. Will do same for HMS Goliath (tomorrow?) and compare just for the heck of it to see if there is much difference. I should be able to start transferring the data to CAD soon. 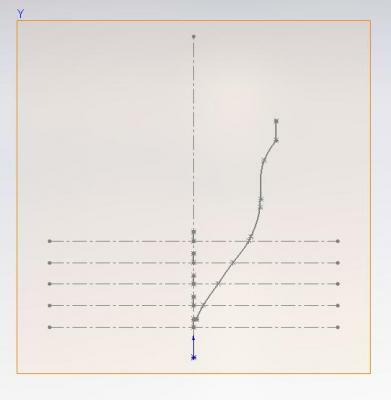 I should also mention that in the PDF program settings I was able to lock the dimension tool to read perfectly horizontal or vertical so no math needed to be done! What a learning experience this has been! 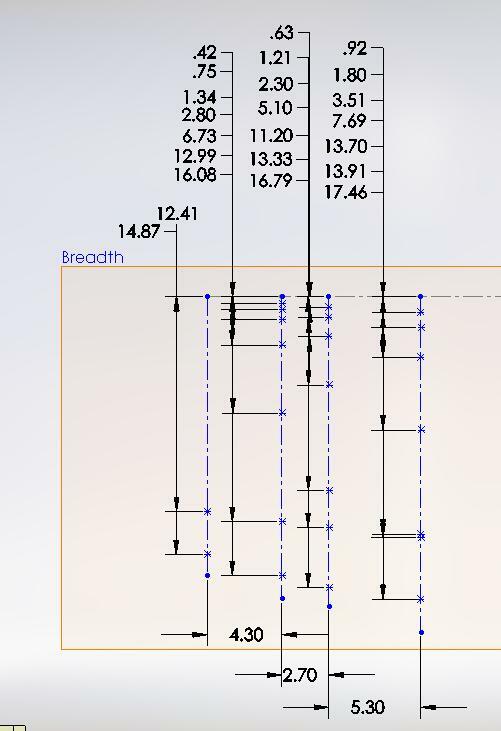 Found the "stretch" in the drawing while measuring and had to go back and double check everything I did in the Shear Plan. I attribute it to the accuracy of a pencil plus the 250 years of storage. Had to compromise on a ratio and accept the fact that it will not be exact. Consoled myself with the fact the actual build likely was not exact either. Reworked my spreadsheet (see partial image below). I did some comparison to the Goliath plans and they seem very much the same although drawn by two very different draughtsmen. There are differences to be seen between the plans with regards to the railing over gun ports and railing height at these gun positions. Elephant rails rise over the two gun ports on each side and Goliath flows level over one and is cut away at the other. Possibly more to be found yet as I spend more time with them. 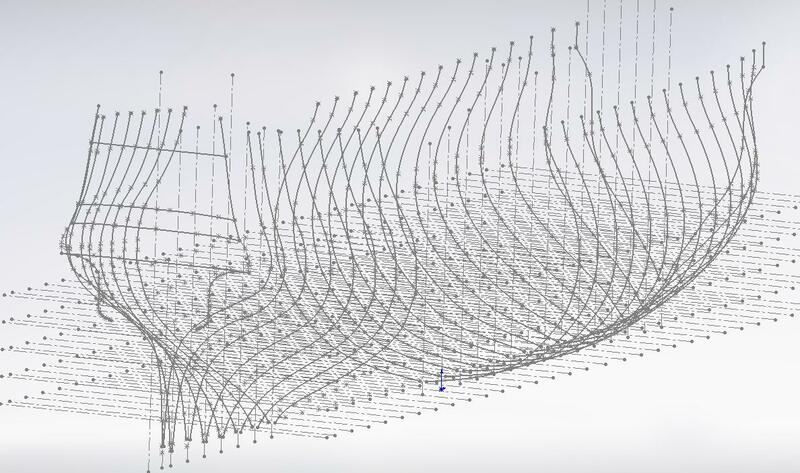 One other thing that played with my mind was that the waterlines in the shear and body plans are sloped. I thought they'd be horizontal. Going to start my CAD drawing next but not today... my head hurts. Waterlines may be sloped or horizontal. It depended on the designer's intent. 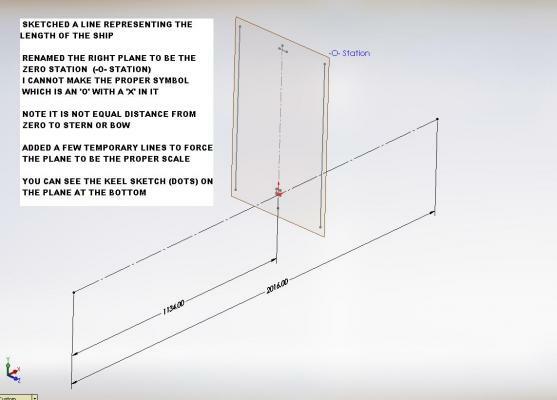 Some ships sailed with the keel level with the waterline, others were designed to draw more water aft than forward. In extreme cases (usually small ships such as cutters) the 'drag' of the keel was extreme. The fact that Elephant was planned to trim with some drag aft is easily spotted on the body plan. The waterlines on the fore body and aft body don't meet at the centreline. 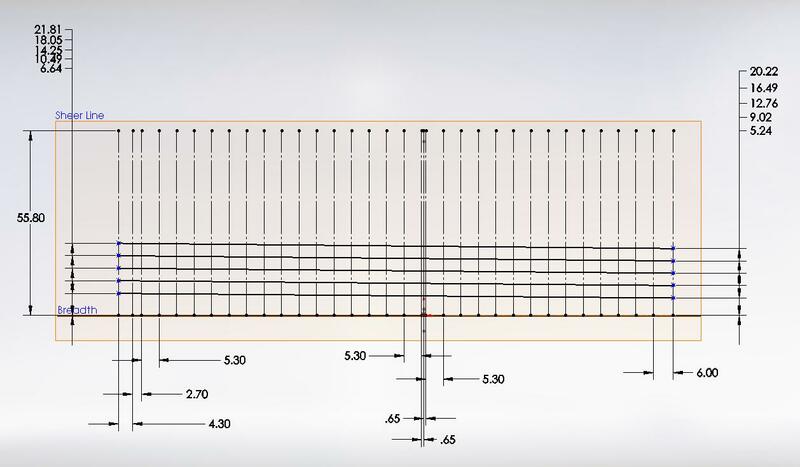 Would you think it would be smart to set up the model build at an angle so the waterlines were horizontal for the build? I got a wee bit of a second wind after supper and got a small start on the CAD side. I should mention I am doing all at this time in construction lines not object lines. Then I will create an Assembly file and put them together. I may change this thinking as I progress ... have to see if it still makes sense. 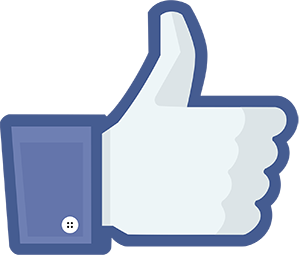 Hi Alan, an interesting project you have started! I will follow this. What I can recommend according to my experence: choice (if possibly as build) only one plan that is lesser distorted, and use only this plan for measurements and redrawing. Use all other plans as reference. 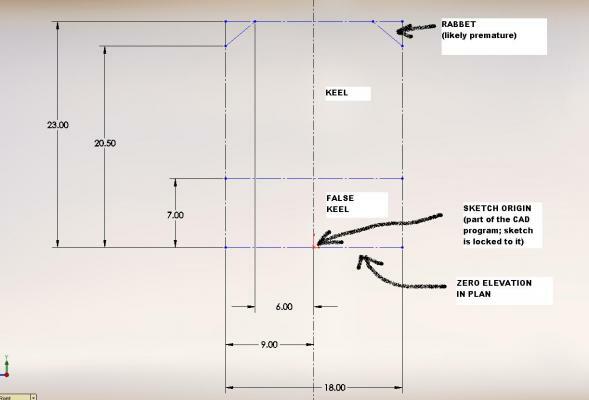 Set the sheer plan with keel horizontal, this will match the body plan as been drafted in this way, and draw you own waterlines horizontal at needed distance (for fairing the frames lines). 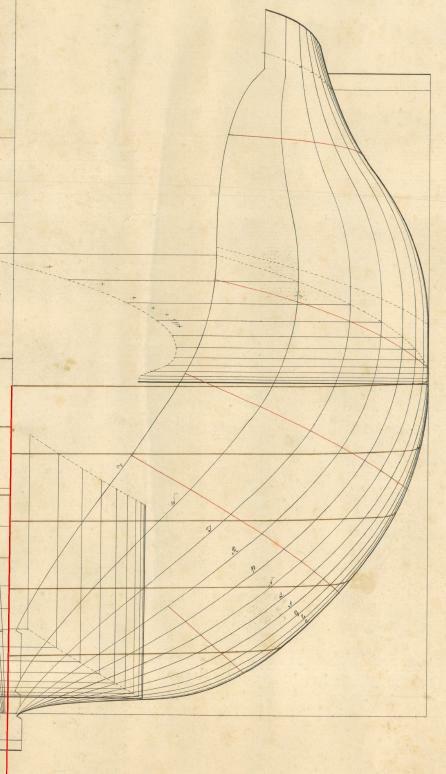 I would also recommend to draw the sheer plan first, with all lines taken from original plan (such as rising line, lower and upper breadth lines, deck lines, rabbet and other), as it was done in those days. You will then have a lot of reference points for accurate redrawing the body plan. I had slept on it and could not imagine any advantage to building with the keel sloped other than to mark the W.L. horizontal. I can easily make a jig to accomplish that ... but I wasn't certain if I might be missing something by not thinking outside of the box. I had decided on the Elephant as my primary source as it had the deck plans available. The Goliath will be my backup for any details that might be fuzzy. Your view on order of staging the drawing is not what I had intended... Now I'll have to rethink that. To me all the internal details seemed secondary (filler if you will) to the outside shell. I can see the advantage to getting the W.L. marked on the sheer plane (to assure they are properly located in the body planes) but admit I need to go back to those wonderful books I just acquired to make sure I understand and fully appreciate what you are telling me as many of the terms are not recognized by me as yet. This will change! This will be a delay in my progress a wee bit but might very well save me tons of aggravation down the road! If there any any other recommendations by you or others they are most welcome!! No, Alan. 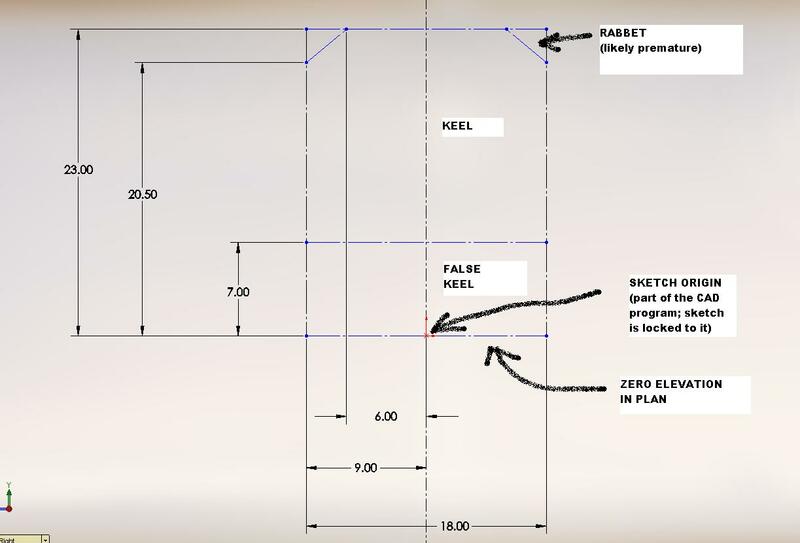 You need to set the keel horizontal on the building board, as the frames are erected at right angles to the keel, not the waterlines. Might I suggest you do some reading up on the subject as well? It will help you avoid some of the pitfalls that await the unwary. 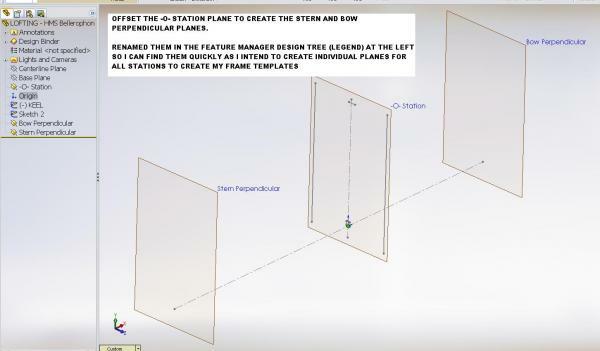 Decided to draw what I can on the breadth and shear planes / plans so I can use these as reference when doing the individual body plans at each station. 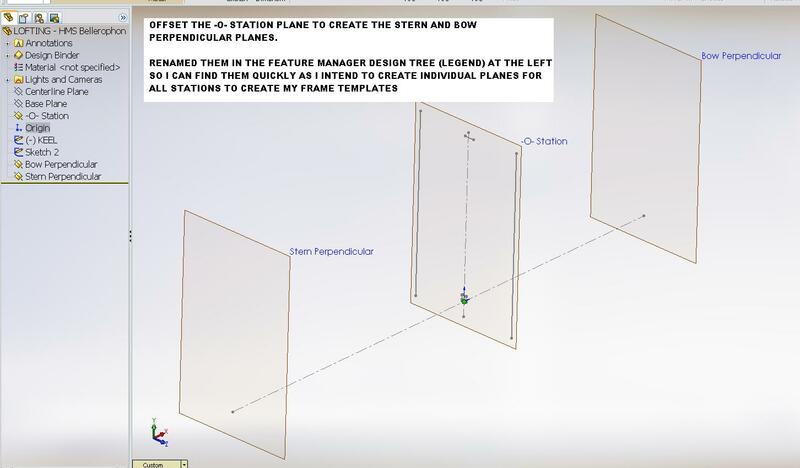 I figured out my rookie error last night and managed to get all my reference planes representing the shear, breadth, station body plans in place and labeled. Had to abbreviate the labels as I could not read them. 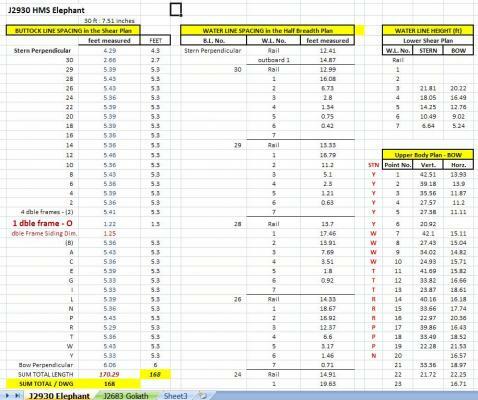 I also changed the dimensional units to feet so it relates directly to my spreadsheet measurements. On a good note I received notice yesterday that my inter-library loan book came in: “The Masting and Rigging of English Ships of War 1625-1860" by James Lee. Will be picking this up today. We have a stat holiday Monday (Family Day in Ontario) so over the three day weekend I hope to do better in the transferring of points and lines to the planes / plans. · The first line must be anchored and fully defined to make the others fully defined. When the line or point are fully defined they change colour from “BLUE” (free to float around) to “BLACK” (locked in place). 7. 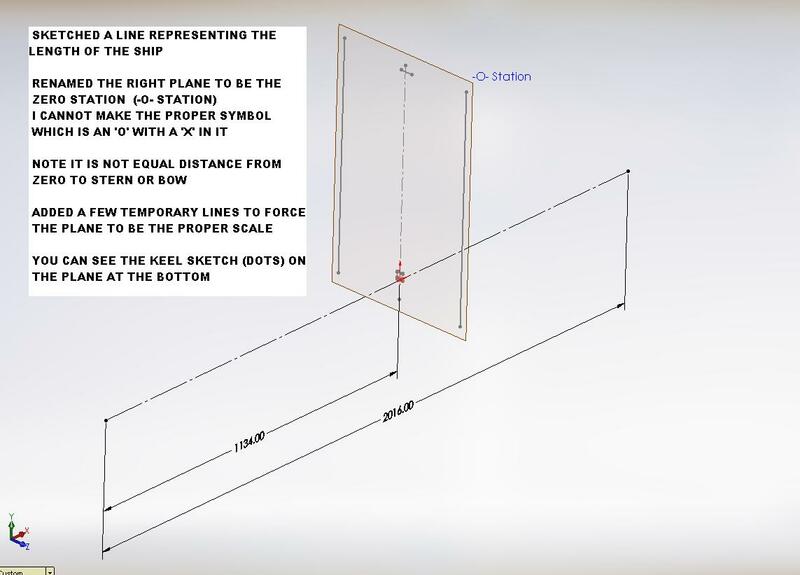 Anchor the distance with a dimension as recorded off the actual plan from the shear line to the point. If the point does not change from blue to black it needs to be anchored as I missed it. 8. I “exit sketch”, “rebuild” and “save” after every set of station points has been completed. 10. 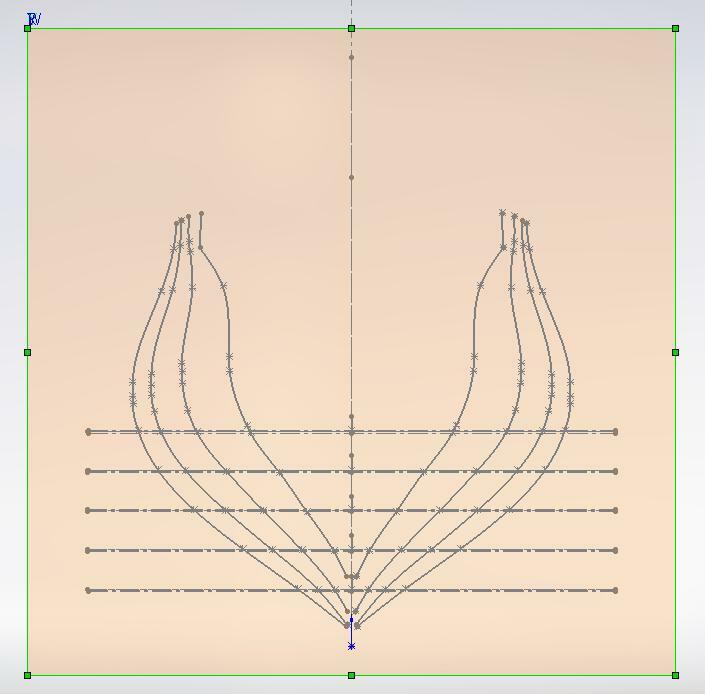 Once all points are plotted and double checked I drew spline lines joining the dots (or asterisk type "points"). 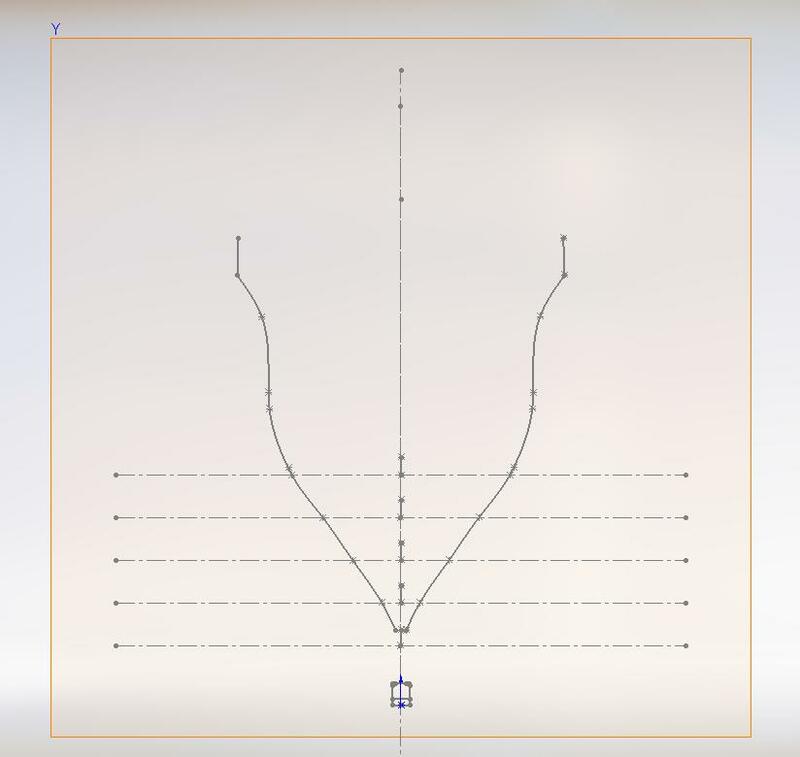 · NOTE TO SELF: next time do one set of points for one line at a time and draw the spline before going to the next set of points. Trying to figure out which points went with which line was a bit of a head scratch in some tight areas. Of course this means more work anchoring each individual "point"
· A couple of the lines seem to be off as compared to the original plan. Likely the reference point locations need tweaking. I will wait to get the body plan done before I do any adjustments. 11. Once all lines are in I mirrored them just for show. Now on to the Shear Plan. This should be quicker as I'll just show the lines for now and get the internal details later. So far, so good, by the look of it. You will still need to 'prove' that all is fair later by use of proof diagonals. BTW, the usual spelling of the curve is 'sheer'. 'Shear' is where something solid splits apart from lateral forces imposed on it. Think of a pair of shears! Shear vs Sheer ... it was a a typo ... honestly! I drew the water lines on the sheer (!) plan. As they are sloping straight lines I needed only the measurement at the stern and bow perpendiculars. I then open station (or buttock?) line Y (just in from the bow perpendicular), projected the water line locations for "Y" from the sheer plan and inserted and located my points based on the water line height and measurements I had taken off the real plan PDF image. Then I drew in the shape following the points and then finally mirrored it. I now only have 30 more to go! You are right though regarding "proving", and I still have quite a bit to fill in on the sheer plan. Regarding the book I received from Inter-library loan. “The Masting and Rigging of English Ships of War 1625-1860" by James Lee. Repeats some of the info I have in the new library I just acquired from a member but lots of photos and diagrams. Might be worth the purchase. 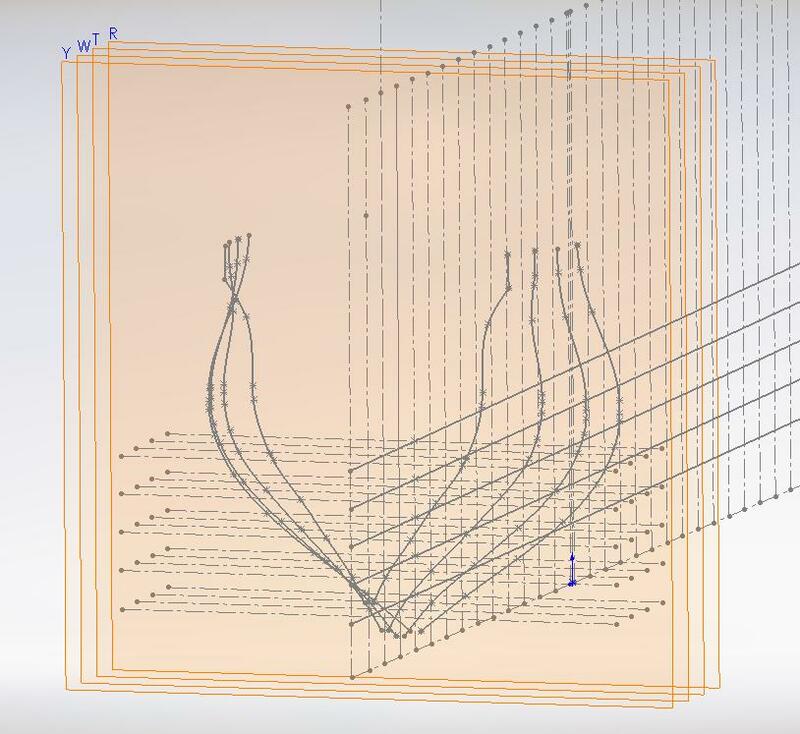 I needed to delete the reference points in all underlying planes (Station or Buttock Lines) because they showed through to the plane (station) I was working on and it was confusing. I had to go back and clear up “dangling” errors as I had located my water lines to them. Vertical and horizontal dimensions added to the water lines fixed this. Love your approach to the issues you faced. And the reasoning on selection. 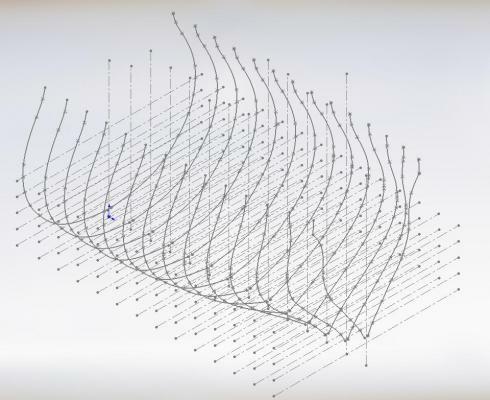 I have tried Solidworks and struggled with the concept and learning. Only ever disigned on good old film. 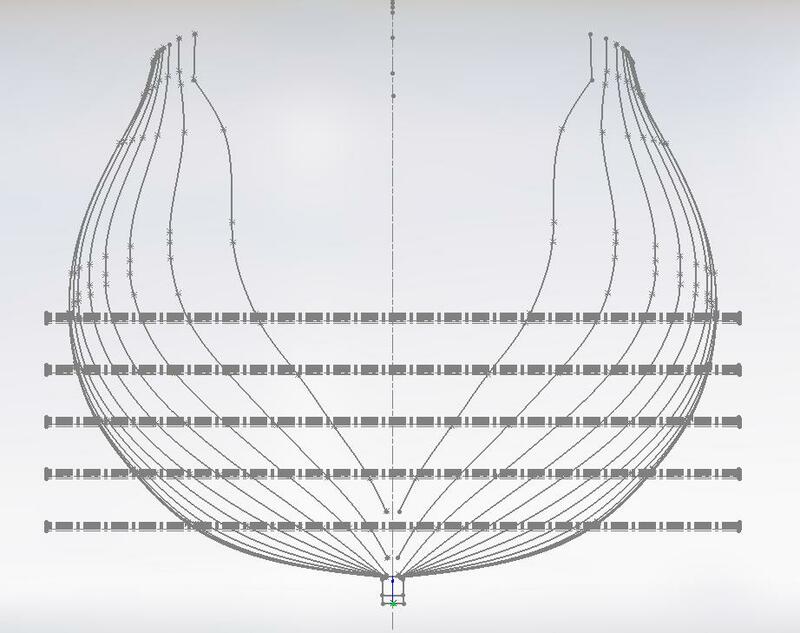 Like yourself I am by no means an "expert" with Solidworks. Having been laid off work for a 1-1/2 years during the economic slump a short while ago I purchased a "how to" book on Solidworks by Sham Tickoo (it stays on my desk for reference) so I could get back into the game as everyone wants 3D models now. 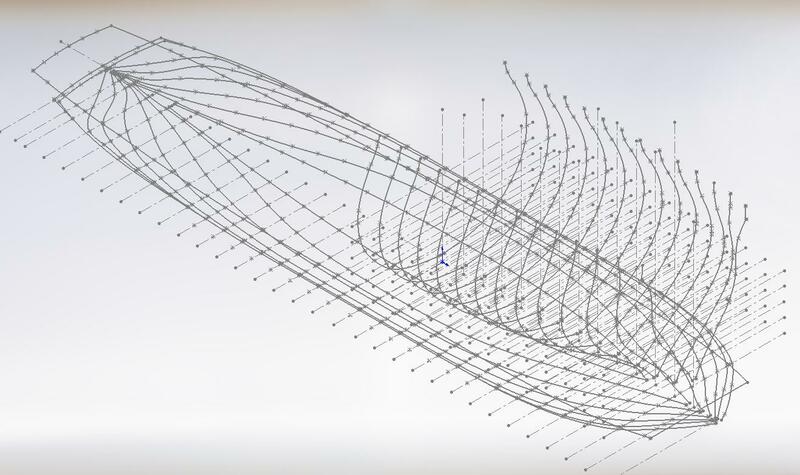 When I finally beat out the 1000 other applicants and landed a job I needed to know how to use Inventor! Went back to the proverbial drawing board and started all over again. Thank goodness they are somewhat similar. At present I only use them on side jobs because my new (back to an old) job has other people drawing. My secret is I try to keep it simple.... though I still need a "do over" occasionally. Had a request for help interpreting a perceived problem... if you had read it I just deleted it as I figured it out. It was a 3D illusion. Managed to get from -O- to Y Foward Section Lines done. I measured these off the Body Plan and compared to the Half Breadth Plan. They are not too far off and blend nicely .. but it took some manipulation of a few sections to look right. So far I am happy with the out come . Next are the Aft Section Lines. 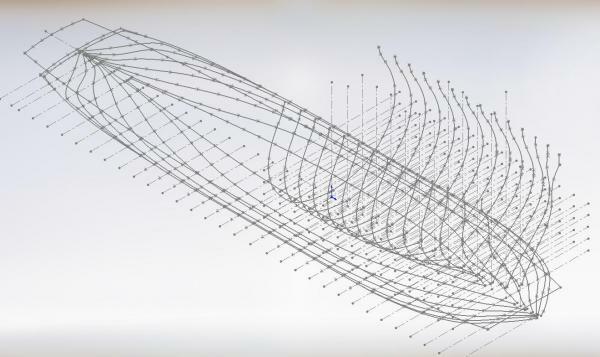 Made further progress, plotted all intersecting points for stations (2) to 30 waterlines. 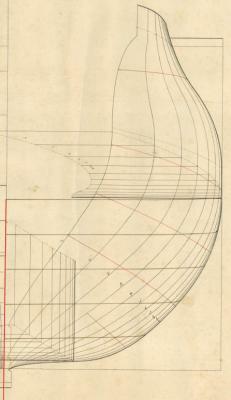 Completed upper outlines at the Aft or Stern Perpendicular and sections 29 and 30. Need to complete (2) to 28! I will post some images when done this stage. Meanwhile here is a picture of my CAD workstation. 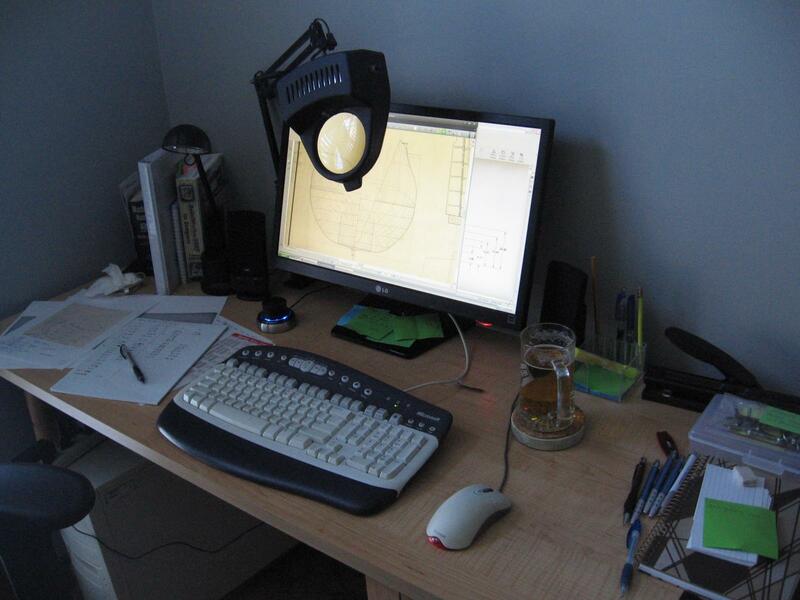 Can you spot the most important tool on the desk? Once this stage is done I intend to review them all together and assure their shape is consistent with the original plan (nothing looks out of place or odd). I'd say the beer as well. It finally got stronger than me. I tried to keep my measurements as accurate as I could so I attribute it to a combination of original paper/pencil draughting error, original paper distortion over the centuries and of course ... me. Although I only have four stations to go I have to stop and make the corrections choosing the half breadth as the plan to follow as closely as possible. My only consolation is that at the scale my build will be no one will notice so long as the points are near and blend seamlessly. Sorry, I don't understand. "Which one" what? I am going to assume what the question means and so that answer is: The actual original plan views do not match each other. The Breadth plan as I plotted it has one point seemingly out of place a wee bit ... likely me. The original body half plans at -0- station are not identical. I've measured them a quite a few times to make sure it wasn't me... hence everything before or after them is out somewhat similarly. I can accept this is normal for a pencil drawing. You can only be as accurate as the point on the pencil and the sharpness of your eye. 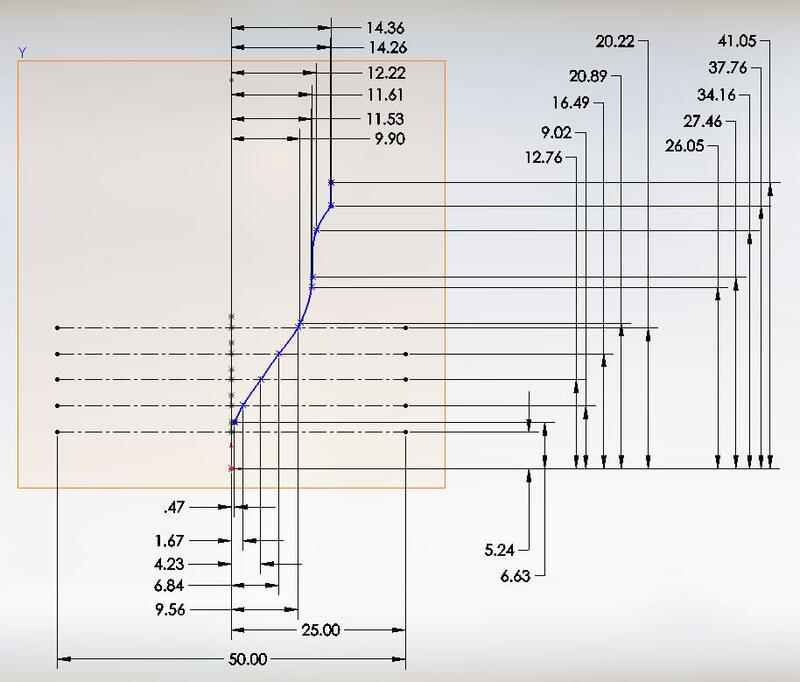 Today with 5 decimal place dimensions on CAD drawings it would not be tolerated. Them were the good old days.